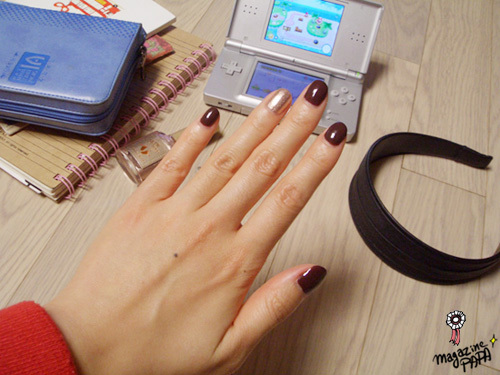 In the pass days I didn’t wear any nail polish but just take care of my nails. However these days applying neat nail polish with cared nails are better looking for 21century women. Some patterns and unknown drawing might be boring so going with simple color would be the best from resting from fancy nails. These products have been introduced before. 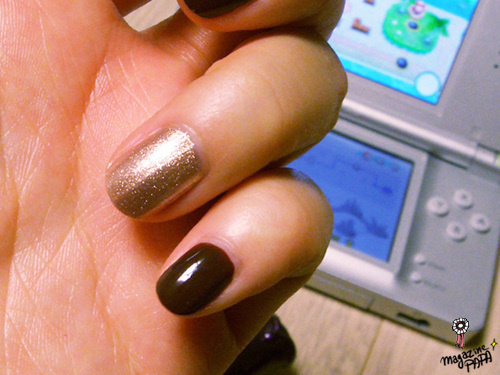 I applied Choco lush twice and three times for spangle gold. The brown color that I wore would be better if it’s lighter than this but not darker anymore. When you are matching similar colors would give great point to the nails. However apply the glitter onto one or two nails and rest do it with matte colors. So it emphasizes the glitter nails. The length of the nails doesn’t matter too. I couldn’t grow my nails so had to apply on short nails. I left my cuticles about a week and it calms down and doesn’t look messy. Some times in nail shop, the artisan will tell you not to cut your cuticles. So don’t always remove the cuticles and leave for a week and it will become neat.